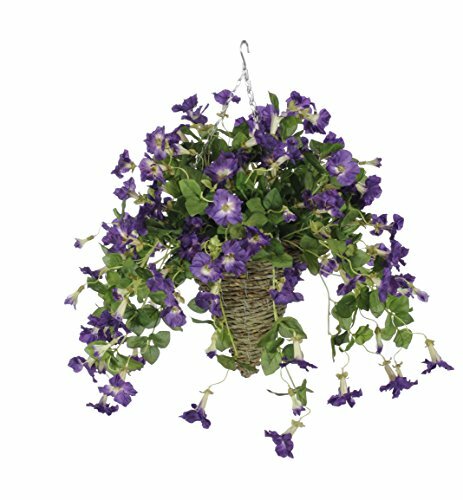 This artificial petunia plant is handcrafted by House of Silk Flowers, and is just dripping with purple flowers. Each plant is securely "potted" in a designer reed hanging basket, featuring 3 14" chains ending in a hook for easy hanging. The basket is 12" diameter x 13" tall. The plant itself is 11" tall from the top of the basket, 22" diameter, and has 18" trailers that flow from the top of the basket. Measurements are approximate, and will be determined by your final shaping of the plant upon unpacking it. No arranging is necessary, only minor shaping, with the way in which we package and ship our products. This product is only recommended for indoor use. Manufacturer: House of Silk Flowers, Inc. Publisher: House of Silk Flowers, Inc. Studio: House of Silk Flowers, Inc. If you have any questions about this product by House of Silk Flowers, contact us by completing and submitting the form below. If you are looking for a specif part number, please include it with your message.